The US ambassador to Israel said in remarks published on Thursday he expected Israel to keep the Golan Heights in perpetuity, in an apparent nod towards its claim of sovereignty over the strategic plateau captured from Syria in a 1967 war. Since early in Trump's term, Israel has lobbied for formal US endorsement of its control of the Golan. Trump has recognised Jerusalem as Israel's capital, breaking with other world powers, but national security adviser John Bolton said last month a similar Golan move was not under discussion. Interviewed by Reuters last month, Bolton said: "Obviously we understand the Israeli claim that it has annexed the Golan Heights - we understand their position - but there’s no change in the US position for now." Responding to those remarks, Israeli Prime Minister Benjamin Netanyahu said there "no way" he would give up to trying to win US recognition. 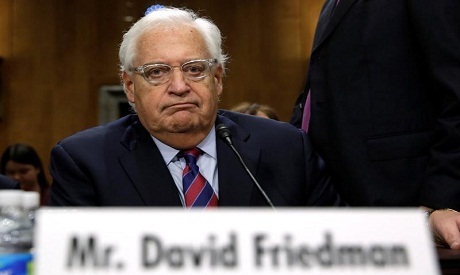 Asked, in light of Bolton's comments, whether it was possible the Trump administration would consider at a future date recognising Israeli sovereignty, Friedman said: "Yes, that's definitely possible. It definitely could happen.